FREEZE THE MOMENT....AS YOU POLISHE YOUR SILVER. AS PROMISED, I'M SHARING MY PERSONAL EXPERIENCE WITH "SPOONING-AWAY" THE SAGGING SKIN/PUFFINESS THAT OCCURS UNDER THE EYES. TRY MY SILVER POLISHE REMEDY AND SEE IF IT HELPS! There are many reasons why--over-time-- the skin under our eyes can sag, look puffy, droop, and become discolored. Makeup can help but it can’t totally conceal the problem. Many factors contribute to this distracting under eye condition… including water retention, too-much salt in the system, allergies, intense crying, lack of sleep, even… sleeping without a pillow. One Temporary Remedy: A SILVER SPOON. I keep 6 Silver Spoons in the freezing compartment of my refrigerator for “emergencies”. 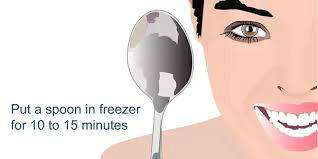 1) The cold temperature of the spoon helps tighten swollen skin under my eyes. 2) I use the rounded side of the cold spoon to gentle massage my eye area (from inner to outer corner) to help jump-start lymphatic drainage. Fluid pools under our eyes while we sleep, often causing swelling and discoloration. I sleep on two pillows which improve my breathing and, at-the-same-time, help with under-eye puffiness. I’ve never been obsessed with my looks--I like to keep life simple---but, from time to time, I need a slight “tune-up”. When you feel "put-together" on the outside, it helps your confidence and self-esteem on the inside. When you take care of small problems as they occur..... it eliminates a major over-haul....later. 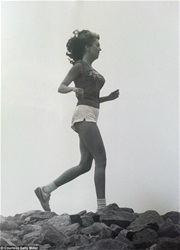 What works for me: I try to stay in-control of my weight, exercise, sleep, health, general appearance, my budget and-- most importantly--my thoughts. I’ve become a strong believer in keeping my daily schedule and--my life--simple.